Linear Technology Corporation has announced the LTC2983 high performance digital temperature measurement IC. 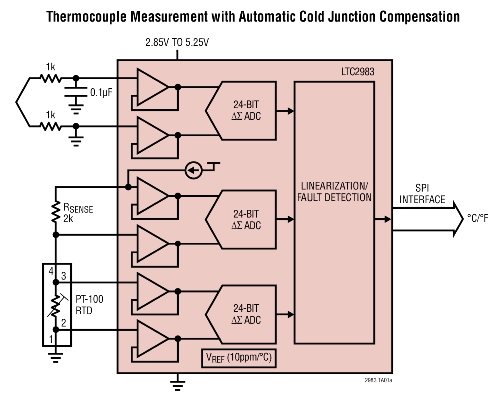 The IC is a single chip solution to temperature sensor interfacing; it has 20 input channels for sensor connection and each input can be assigned the characteristics appropriate to the sensor used. This includes 8 standard thermocouple types, 8 RTDs, 8 thermister profiles and an external diode; if you are using a custom sensor you can also specify a custom table. In addition to the impressive sensor capability the IC measures temperature with an accuracy of 0.1°C and a resolution of 0.001°C. The LTC2983 allows direct interfacing to ground referenced sensors without the need for level shifters, negative supply voltages, or external amplifiers. All signals are buffered and simultaneously digitized with three high-accuracy, 24-bit ΔΣ ADC’s, driven by an internal 10 ppm/°C (maximum) reference. READ LANp – A DIY Arduino network controllable RGB lamp made from scanner parts!